Sandwich is turning 20 this year and has already kicked off the celebrations with the release of their new single, 'Time Lapse'. In an announcement via their social media channels earlier today (2/6), the band shared the details of their anniversary celebrations. 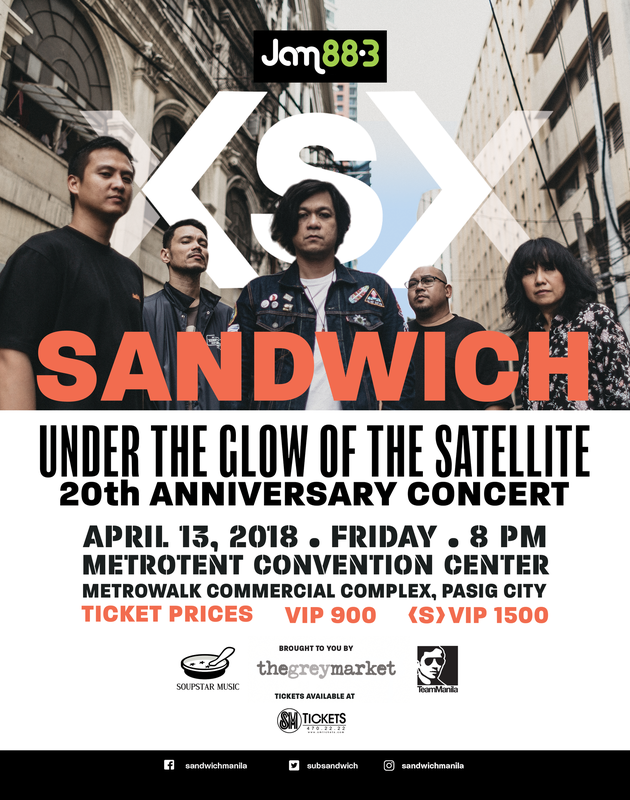 Sandwich's 20th Anniversary Concert, Under the Glow of the Satellite, (a line from 2003's '2 Trick Pony') is happening on April 13, 2018 at the Metrotent Convention Center. In an interview with Bandwagon, guitarist Diego Castillo shares that they're toying with the idea of performing 20 songs from their complete discography and recently had a listening session to try and choose what they all wanted to do. Castillo admitted it was much harder than he expected, having a total of 8 albums in their discography. Autotelic, Ciudad, She's Only Sixteen, Tom's Story, youngsleepyboi, and Diego Mapa are set to open the night. VIP tickets priced at 900 PHP and SVIP tickets cost 1,500 PHP. SVIP ticket-holders each get a limited edition 7" vinyl record of the band's new songs, 'Time Lapse' and 'Parang Walang Nangyari'. Tickets are now on sale via SM Tickets. Limited edition t-shirts and posters, designed by Team Manila will also be available at the event.